Route 66 (US 66), also known as the Will Rogers Highway and colloquially known as the Main Street of America or the Mother Road, was one of the original highways within the U.S. Highway System. This Route 66 clock adds a nostalgic accent to your home or office. Constructed of metal and hand painted to give it an antique look. 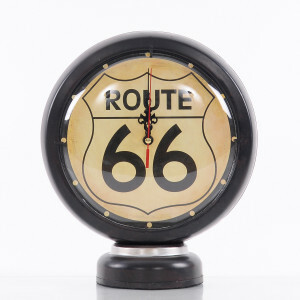 The clock measures 10.5 inches in diameter and has a visible Route 66 and decorative hands to mark the time. The clock contains a quartz movement and runs on 1 AA battery (not included). This piece makes a great gift for automotive enthusiasts that is sure to be admired.